It must be winter. How else to explain that we've started on yet another room renovation before we've even finished the craft room. The same thing happened in 2008 when, in the depths of a March winter storm, we decided to spontaneously transform a guest room into a green office for two. Being cooped up indoors apparently makes us very productive, ha! We've decided to transform the dining room. With the living room looking fabulous, the dining room across the hall looks even more tragic. 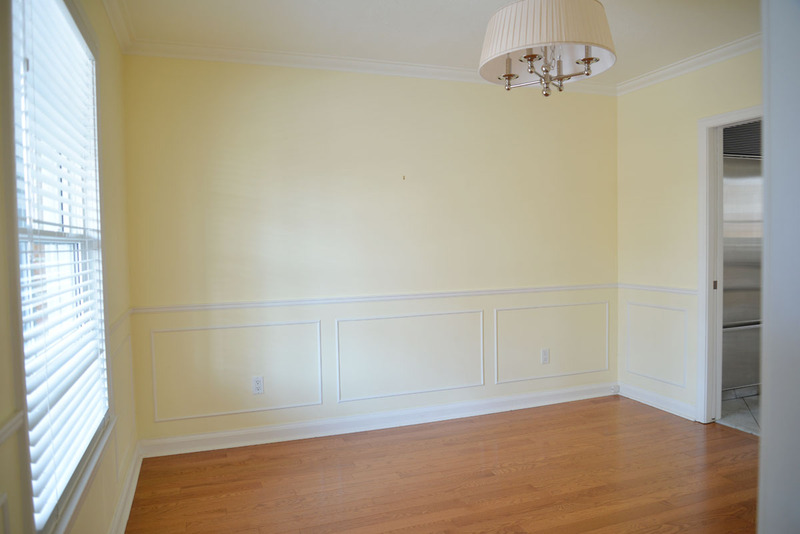 Here's how it looked the day we bought it... boring, plain, and very yellow. The great thing about a room like this is that you can create a whole brand new look very easily. The challenging part is that you have way too many options to choose from! In designing the room, I knew I wanted a mix of modern and traditional. I'm craving colour these days and this is a perfect room for taking some design risks. The dining room isn't a room we're constantly in, plus the pocket doors make it easy to close the room off from the rest of the house. The room is at the front of the house so why not make it a showpiece? I've resigned myself to the fact that I will never live in an Instagram-perfect white walled minimally designed home. Though I like those photos, in reality I crave pattern, colour, texture, traditional style and architectural details. And most of all, especially lately, I want rooms that make us happy. In a world that seems increasingly unhappy, I want our home environment to be one of joy. I want rooms that make me smile, even if I just catch a glimpse of them as I walk up the stairs. I want all-over pattern granny-ish wallpaper that makes my heart sing, even if its not a popular choice. I want to sit in my 15 year old dining chairs, even though I can buy a new set that is lighter and brighter and more modern. With this home, I'm finding I'm making more deliberate choices and being more conscious about what I bring (and take away) from my home. This is the design I've landed on. I haven't purchased all the elements yet though I'm sure we'll end up somewhere close to this rendering. The other thing I've resigned myself to? That our home renovation and DIY projects take much longer than they did a decade ago when I first started blogging. It could be because we live busier lives now with a daughter and jobs to distract us. Or that we're older and don't have that youthful energy we once did. 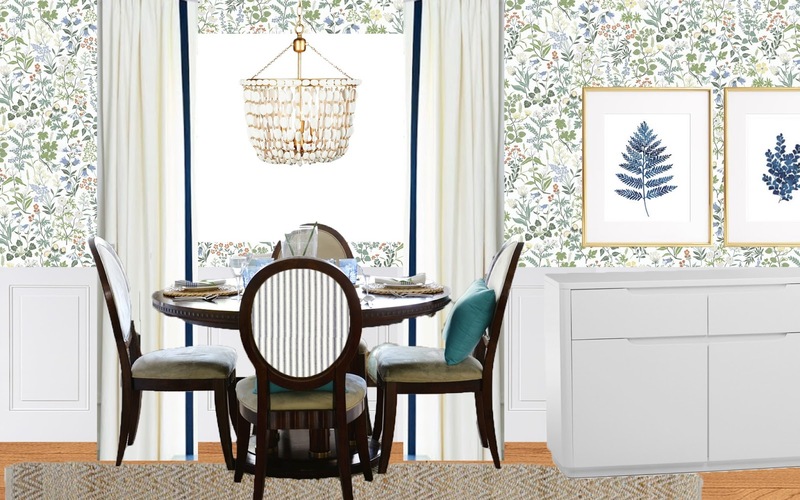 But, maybe, I've learned that the process is the joy... that sifting through paint chips and wallpaper samples is my idea of bliss and deciding on the perfect chandelier is a problem I love having. Blogging and social media and the rush to get to the After can be good motivators, but they sure can make you forget to enjoy the moment and all the messiness that comes with it. I'm not sure when we'll get to finishing off this room, it will be after the craft room, that's for sure. But when we do, I know I'll be thrilled with the end result because I've enjoyed every step along the way.